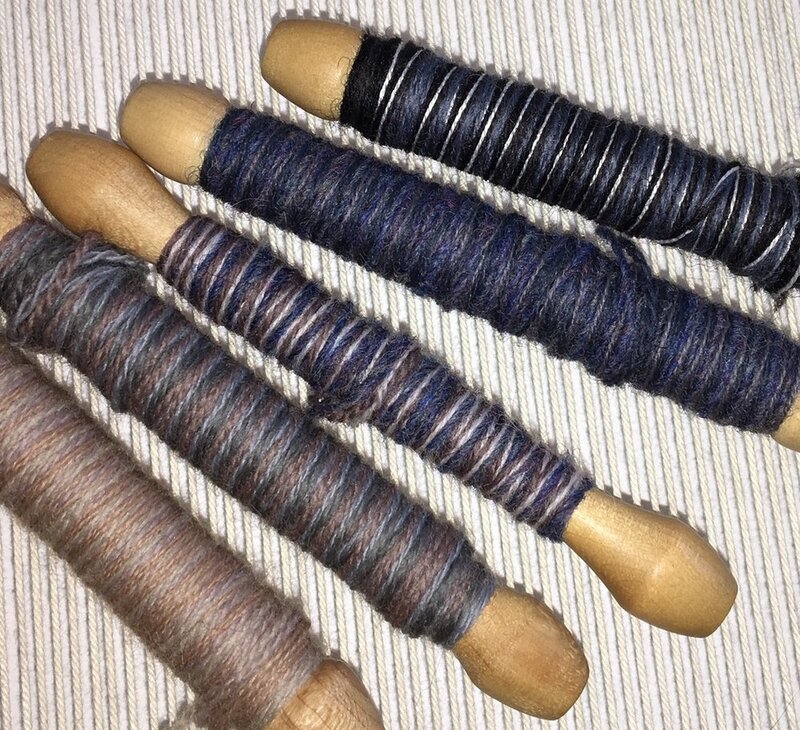 I often mix a variety of threads in my weft bundles, winding them onto Aubusson bobbins. Since I do not dye my yarns, I work with the different color palettes of yarns in my stash, as well as from what is currently available. Some of the wools I use are: Anahera (New Zealand wool), Appleton crewel weight wool, Australian Tapestry Workshop wool, my mother’s hand-dyed yarns of varying weights, and my stash of no longer produced yarns: Paterna crewel and DMC Medicis wool (similar in density and thinness to Weaver’s Bazaar fine 18/2 weight). 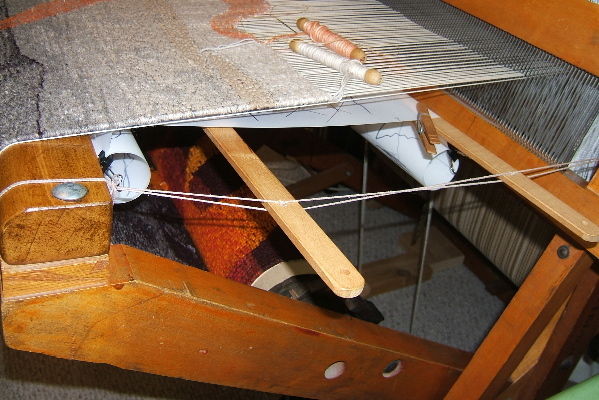 the diameter of the warp = the diameter of the weft = the space in between each warp thread. To determine a weft bundle diameter, it helps to twist the several strands in the weft bundle together and place it in the space between the warps. The twisted weft bundle needs to occupy this space without overlapping the warps beside it. When I want a little sheen, a contrast to the matt surface of wool, I will add a strand of pearl cotton (available in different weights). 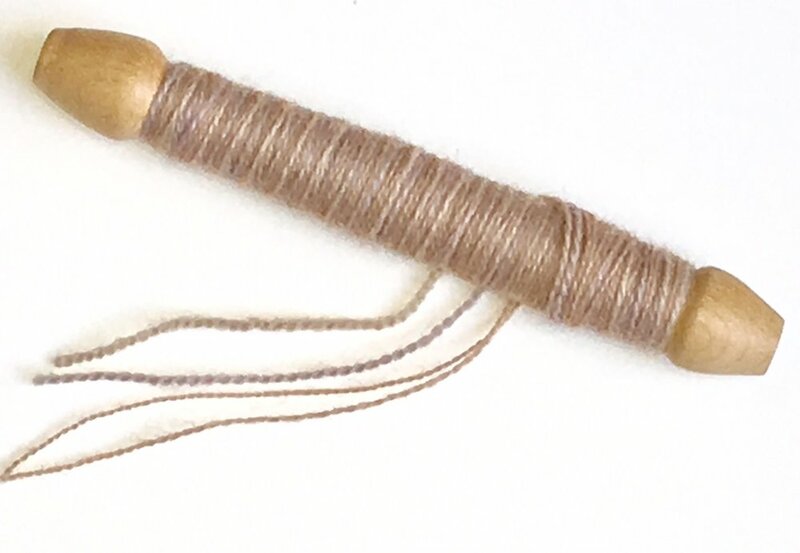 I wind multiple strands of weft onto Aubusson bobbins by using a Swedish bobbin winder (the one with the smallest shaft measuring 1/8” in diameter at the smallest end). In the video, I demonstrate how to wind four different strands of yarn that I am mixing for one weft bundle, in such a manner that all four strands wind onto the bobbin evenly, with a similar tension on each individual thread. This is important if you want to have a smoothly woven surface, with no unexpected bumps caused by one strand being looser in the weft bundle. Also in the video, I demonstrate the hand gestures, les bons gestes, for efficient weaving, and for preventing the weft bundle from scraping against the warp threads, which will cause fuzzing of the weft. I generally twist the strands in my weft bundle as I weave, by twirling the bobbin and then winding the twisted area onto the bobbin. This makes all the strands become one thread. There are times when I will not twirl the bobbin because I want to a particular strand to show up more, as a particular pattern in the weaving. On my basse lice (or basse lisse) loom, I am using a 12/12 cotton seine twine warp at a sett of 10 ends per inch. My weft bundle needs to be about the same diameter of the 12/12 cotton seine twine. 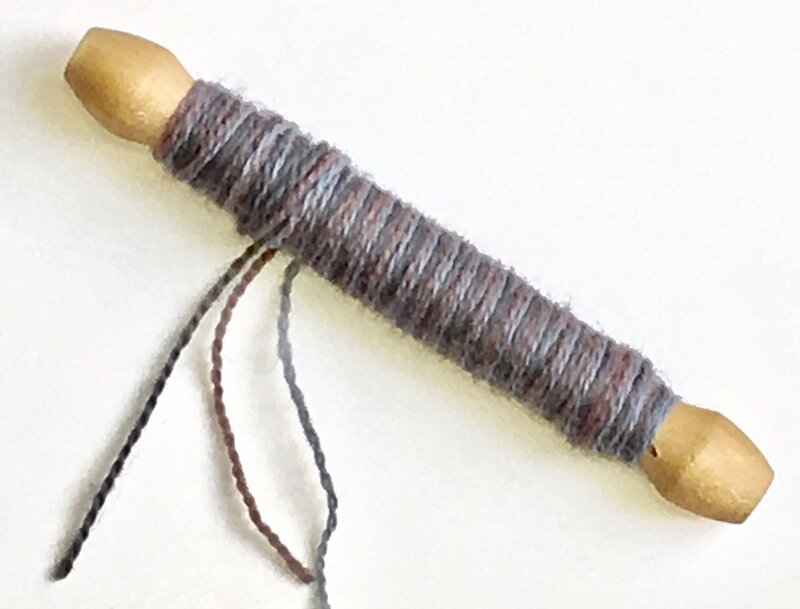 I have a Resources page on my website that lists sources of different yarns currently available, as well as other tools and supplies for tapestry making. Rebecca Mezoff also has a blog post describing weft yarns for tapestry. 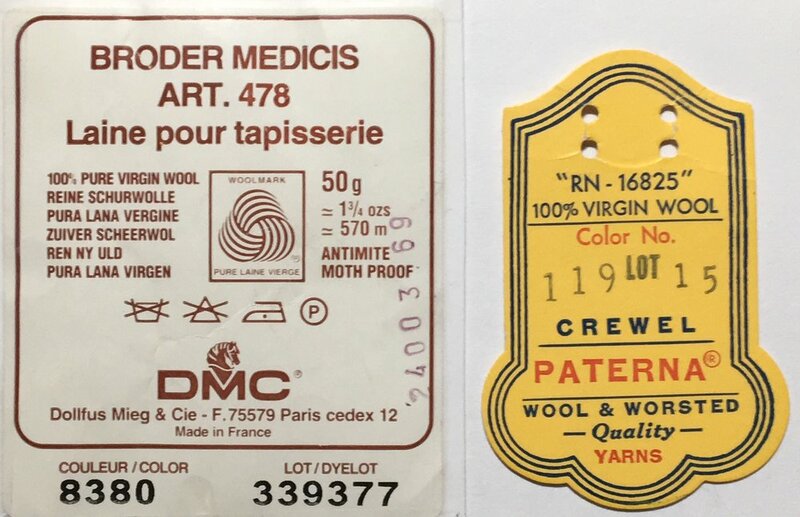 Labels for DMC Medicis wool and Paterna Crewel wool, no longer being produced. When I sit at the loom, absorbed in the weaving growing before me, all words fall away, and I am in my mother tongue. 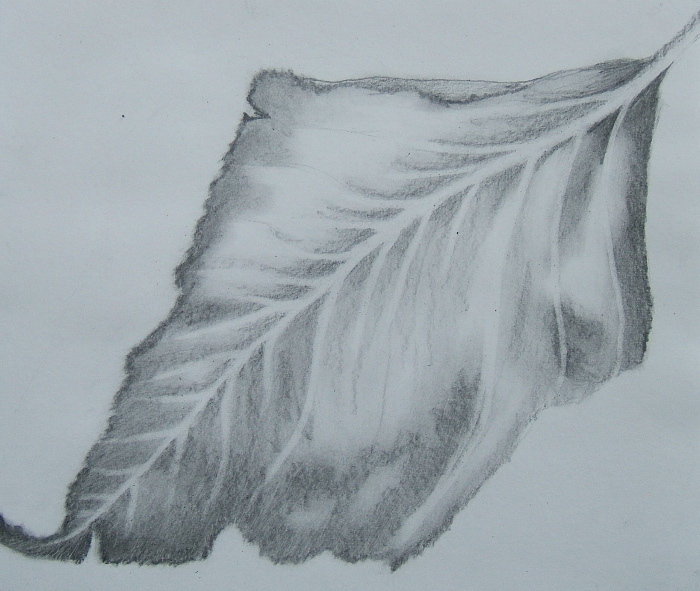 Tapestry is like breathing for me: automatic, and the air that sustains me. 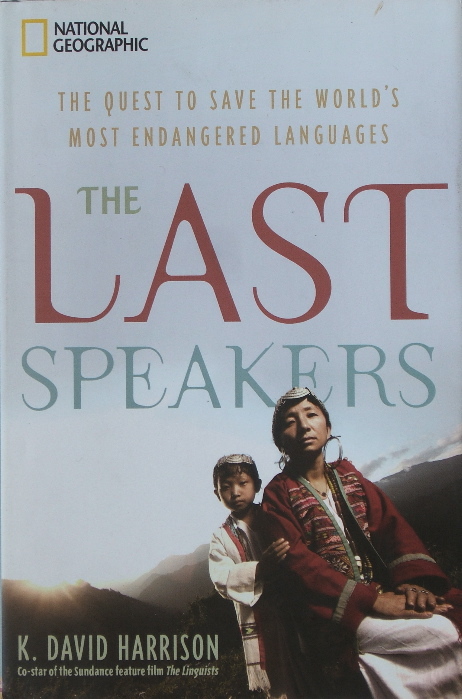 My college French teacher, Marguerite Hessini, spoke of la langue maternelle, one’s mother tongue, the language one first speaks and the language one automatically uses to articulate one’s thoughts. She, herself, grew up speaking three languages: Alsacian, French, and German, then subsequently learned and became fluent in English, Arabic, and Spanish. 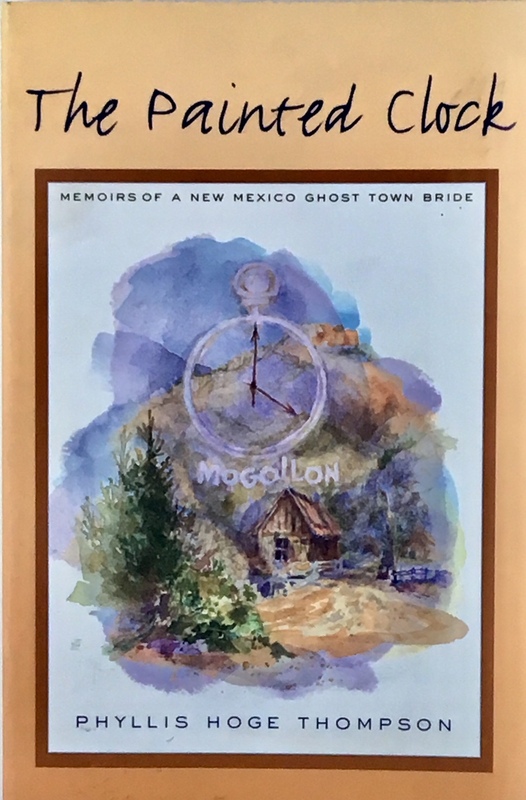 She later completed her doctorate in Linguistics and spent one summer living in the desert, assisting a Southwest Native American culture in documenting their mother tongue and in developing educational materials written in this language. For me, the term, la langue maternelle, goes beyond the verbal linguistic realm to that of hand woven tapestry, and the language of the loom that I was well-versed in by the age of 10. 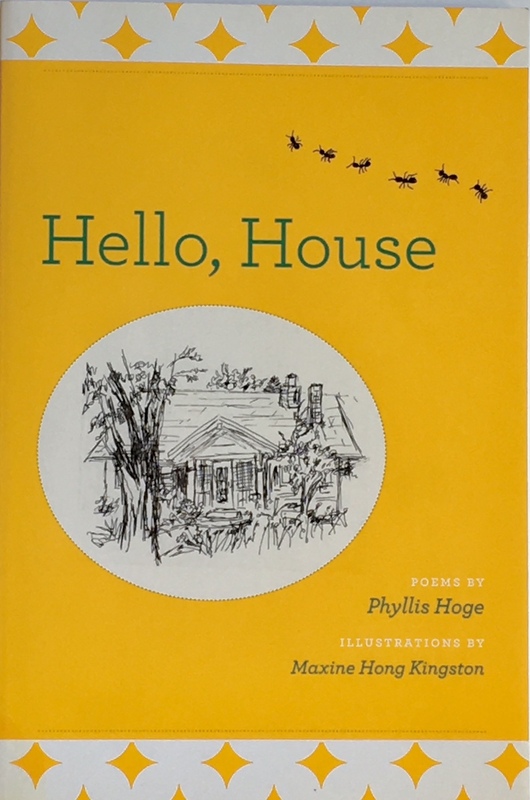 It made so much sense to me, and I loved how my hands could make vertical and horizontal lines, hills, valleys, angles, and shapes in the warp. For me, la langue maternelle of tapestry also literally did come from my mother, Esther J. Kolling. As I developed my verbal language skills in English as my primary language, and in French as my secondary language, my eyes and hands also were becoming fluent in the non-verbal languages of woven structures and color. In many ways, the language of the loom became my mother tongue, as my initial thoughts tend to come as images, colors, textures and techniques before I translate them into words. I automatically think in this non-verbal language, and my hands often know things before I have the words for them. 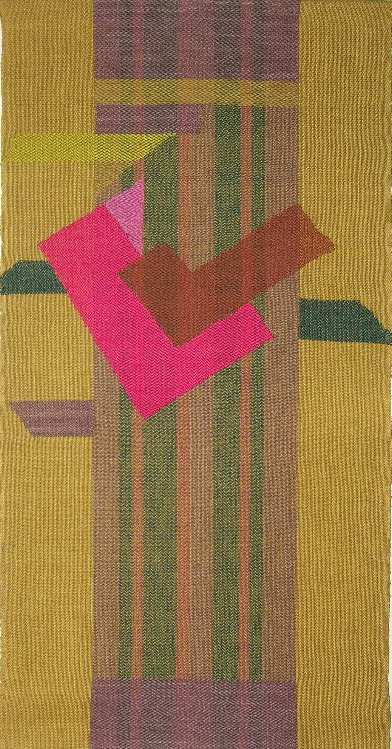 In the case of tapestry, the conceptual universe of thought is encoded in thread and technique. One of the amazing things about tapestry is its universality, across time, cultures, and how it transcends words. 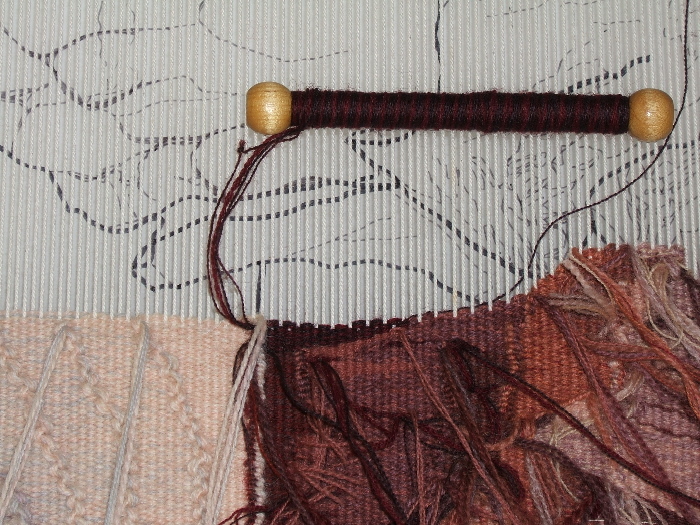 We look at a tapestry, regardless of where or when it was made, and can read it, study the technique vocabulary, and marvel at what is said in this language of discontinuous wefts. 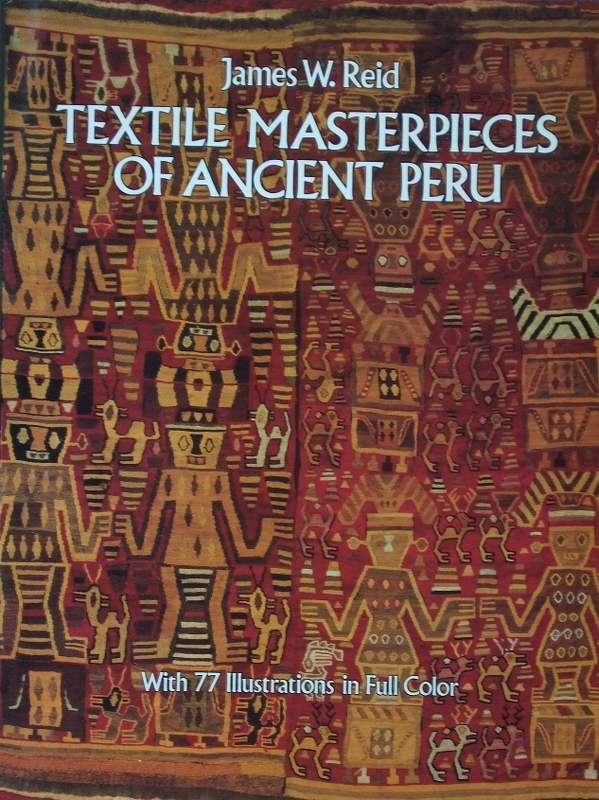 I am reminded of how Susan Martin Maffei has described the Huari culture of pre-Inca Peru, where everyone—children, adults, men, and women—was expected to participate in the various phases of tapestry weaving; of how tapestry was the language, the form of currency, as well as served to define social status. The dead were wrapped in up to 20 layers of tapestry fabric, to assist in the realm of the after life. What would it have been like to live in such a cultural environment! The week of November 17, 1991, the French government announced its decision to uproot and disperse Les Gobelins Tapestry Manufacture from Paris, including: Gobelins vertical warp tapestry weaving, Savonnerie rug weaving studios, in-house and foreign student training programs for both studios, the dyeing studios, and the restoration studios for rugs, tapestries, and furniture (IFROA, the French Institute for the Restoration of works of Art). Weavers not willing to relocate would have to retrain for other work. Micala Sidore wrote a page report about this in the December 1991 newsletter of the International Tapestry Network (ITNET). 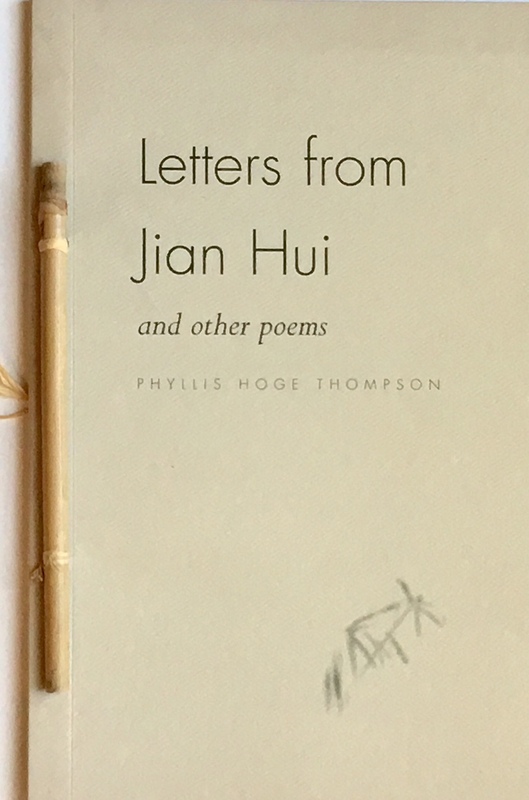 The global community—tapestry weavers, museum curators, textile conservators, citizens, and countless others-- responded by sending air mail letters and postcards of protest. (This was before we had the internet). The world outcry was large enough that on January 29. 1992 the Minister of Culture, reversed this proposed plan, although it did terminate the training and education program at Gobelins, shifting students to the Aubusson Ecole National des Beaux Arts and also moved the restoration studios to Aubusson. In addition to writing my letter of protest, I also knew that I needed to go to Aubusson to learn what had not yet been documented, before it vanished. In the case of the atelier Tabard, which wove the bulk of Jean Lurçat’s Chant du Monde (Song of the World), it was too late. Their technical knowledge died with the death of the last tapestry weaver of that family. 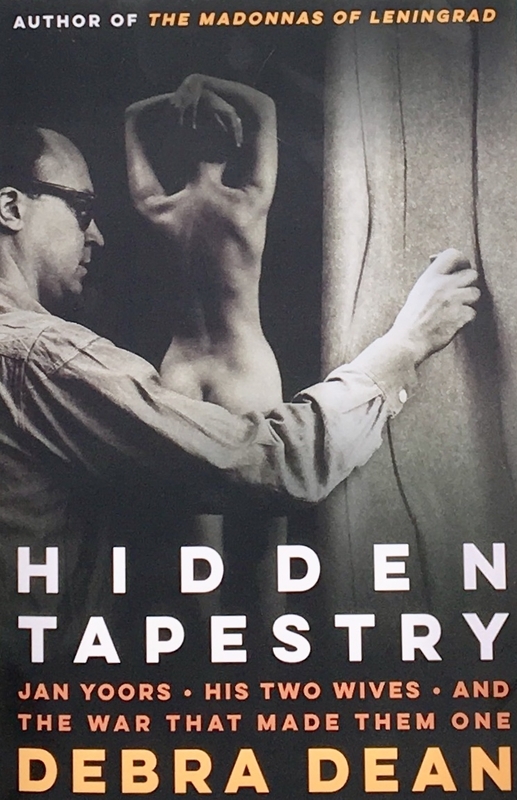 But it was not too late with Gisèle Brivet, a fourth-generation tapestry weaver who worked collaboratively with her husband, Henri, who also had recently retired from teaching tapestry design at the Aubusson Ecole National des Beaux Arts (which is now closed and is being converted into a tapestry museum, renamed Cité internationale de la tapisserie Aubusson). No one in their family was interested in learning tapestry, so they went against the centuries-old atelier tradition of never sharing tapestry secrets outside the family, to pass on some of their love, process, and technical skills to me and two other weavers from the United States. I wish I could have stayed longer, to learn more. 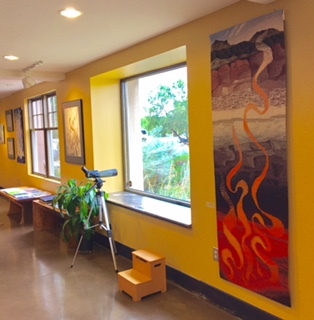 In June of 2005, Tapestry Weavers West celebrated its 20th anniversary with a symposium: Tradition in Motion: New Forms, Attitudes and Approaches to Tapestry. Here Phillipe Playe, director of the Beauvais Tapestry Museum and Mobilier National in France, announced that their six-year training program was no longer going to accept new students as they could no longer guarantee jobs for its graduates. He suggested that like the grape growers in California and in France helped each other out in times of drought, perhaps the same could be done in tapestry as well, with the weavers here in the United States carrying on the knowledge. Phillipe Playe taught two workshops in the United States with Jean Pierre Larochette and Yael Lurie to textile conservators, tapestry teachers and artists, myself included. A number of us who studied with these and other tapestry masters now teach and pass on this knowledge. 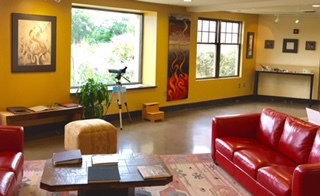 Many of us do so as itinerant instructors at our studios or retreat centers, through weaving guilds or arts centers. 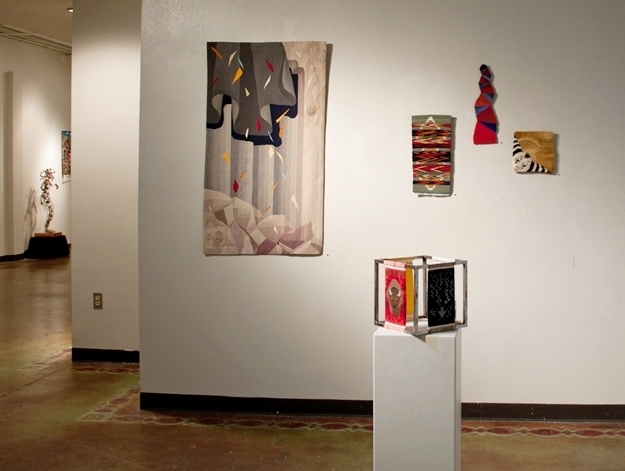 Over these past decades, most university institutions in the United States have eliminated their fiber arts programs, some of which did include hand woven tapestry. 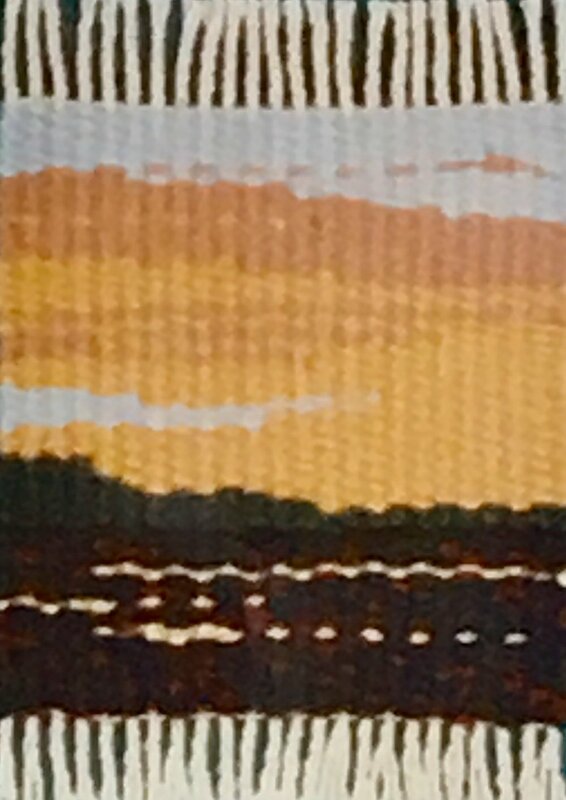 Many of us tapestry artists are in the second half of our life spans, producing work that few art galleries are willing to represent because there are no guarantees of sales. We live in an era that embraces high-speed internet, computer technology, and the encyclopedic form of knowledge in mainstreamed, dominant languages. 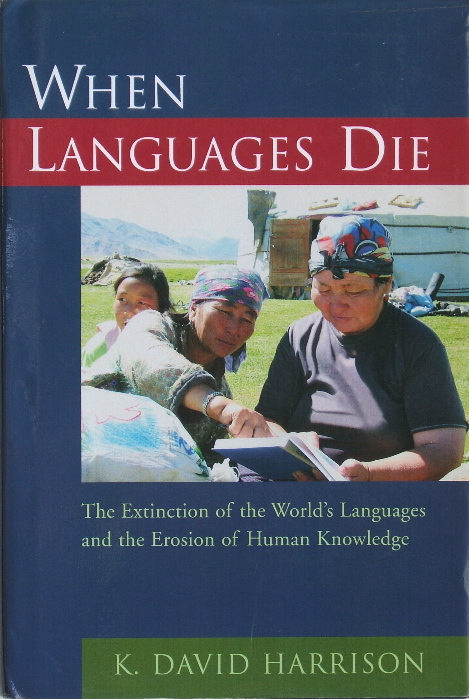 It is ironic that with all of this information at our finger tips, we also are facing the extinction in our lifetime of over 500 oral human languages, and all of their accompanying vocabulary, thought systems, cultural and environmental knowledge. This is the world of the coming generations, who’s fingers are trained to text message and to type on keyboards, and who may or may not have interest in learning that there is so much more one can do with one’s hands. Is the language of tapestry and the knowledge of weaverly hands going to survive? I have great hope that it will. Over and over again, I see where one person can and does make a difference, be it through teaching, curating exhibitions, making videos, writing and publishing books, establishing organizations and study groups, building websites, and creating new works in tapestry. I am doing my part, as are so many others. We each do make a difference.